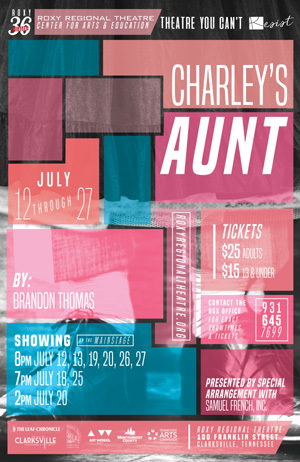 Jack Chesney loves Kitty Verdun, and Charley loves Miss Amy Spettigue. They invite the ladies to lunch to meet Charley’s wealthy aunt from Brazil, but when she cancels her visit at the last minute, the millionaire aunt sends the boys into cataclysmic confusion. What do they do now? The problem is solved by drafting their feckless Oxford undergrad pal into a black satin skirt, bloomers and wig to impersonate Charley’s aunt — setting off a hilarious chain of classic comic confusion! Presented by special arrangement with Samuel French, Inc..